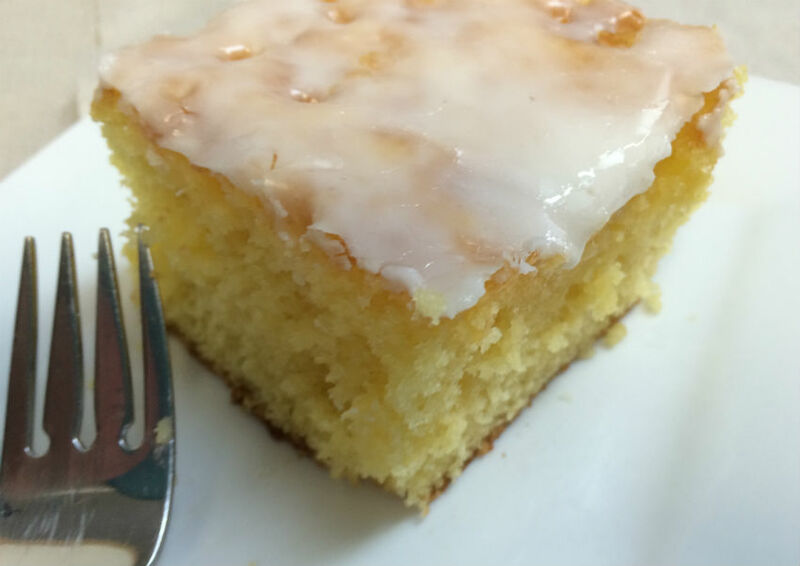 If you like lemon, you will love this extra moist, extra lemony dessert. 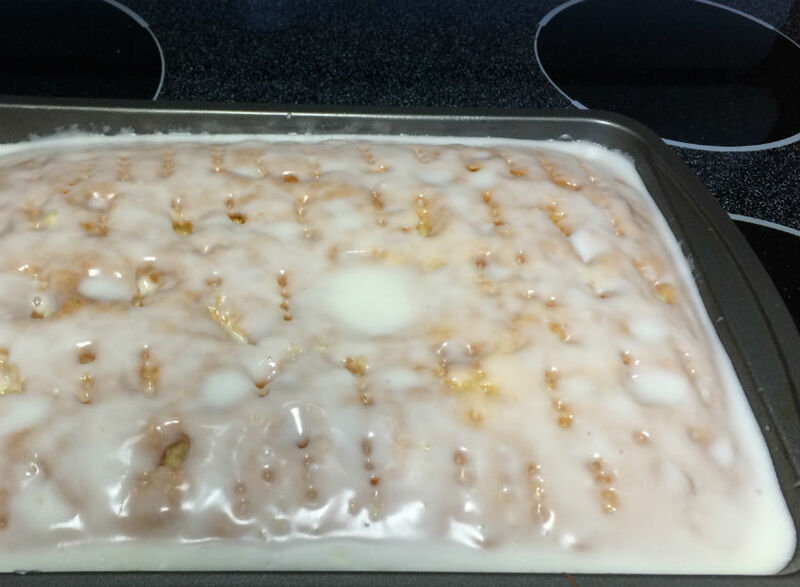 Lemon Jello Cake was one I always requested when Mom would ask what cake I would like for my birthday. 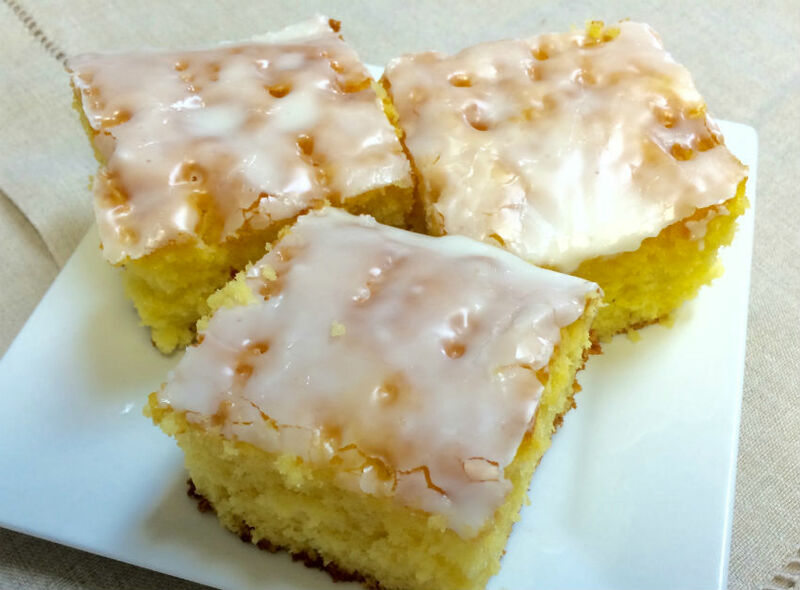 Without traditional frosting, it is lighter, yet with the lemon jello in the cake and juice in the glaze, it has such a moist sweetness in every bite. Every bite offers that tart lemon taste that is simply delicious. It’s simple to put together too, and takes no time at all to have it ready to go in the oven.Once in awhile I will sprinkle powdered sugar over it, but the glaze provides plenty of sweetness. It’s a popular dish to serve for coffee meetings, brunches, and potlucks, or any time dessert sounds good. Another thing I like about this recipe is how well it freezes. Once it cools, I will cut it into individual servings (unless I am making it for an event). Wrapped in plastic wrap or foil, stacked on a freezer shelf, it freezes beautifully. When you want a serving, pull it out before dinner to thaw, or place it on a plate in the microwave for 30 seconds to 1 minute. Tastes fresh and sweet, as though just baked. It’s such a lemon satisfying dessert Give it a try. Stir together cake mix and jello. Add water, mixing on medium speed until thoroughly blended. Add oil, mix until all is smoothly combined. When cake is just out of the oven, poke holes every inch using a fork. Pour glaze over the top while still hot, spreading to cover. All you need to make this wonderful cake is a hand mixer like the one below and a baking pan. Simple as can be. Since downsizing, I have found this small, handy mixer is really all I need. I love mine. It has all the power I’ve ever needed. I admit one of may favorite things about it is its ease of storage. Maybe I am an organizational nut, but it pleases me every time I put the cord back into the little storage case it fits into. It takes up so little space in the cupboard, is easy and lightweight to grab (which matters more the older I get), and cleans up beautifully. I’ve had mine for years now. If you buy a good set of baking pans, chances are they will last for decades. This is my favorite, for a baking pan and cookie sheets. With an insulated pan there is much less risk of burning the bottom of what you are baking.It seems to provide a more even heat too. This particular one has a lid, which is such a plus for keeping out on a counter or for stacking in a fridge. Great for transporting too, if you are taking it to a tea or a potluck. forward to trying your version. Thank you! I grew up with Mom making this wonderful cake! It is one of my two favorite cakes. You can put a dollop of whipped cream on it too, if you want to. And oh…make sure that you use fresh squeezed lemons…NOT…bottled lemon juice. Enjoy!